On August 1, 2015, former King Michael of Romania signed a document removing the title Prince of Romania and the qualification of Royal Highness from his grandson, Prince Nicholas. Nicholas has also been removed from the line of succession. 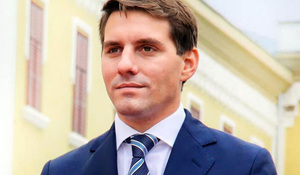 Since April 1st 2010, which was his 25th birthday, the King’s grandson Nicholas Medforth-Mills, had been raised as a Royal Highness and a Prince of Romania, with the expectation that he would one day succeed his aunt, Crown Princess Margarita of Romania, as head of the Royal Family. This is now evidently not to be. Little explanation has hitherto been given to this extraordinary and unprecedented step. The brief state-ment mentions that “Romania needs a ruling marked by modesty and moral principles” – which indicates that the poor Prince must have made himself guilty of horrible transgressions. The action as well as the wording is actually a vicious Guantanamo like treatment of a young man’s life and reputation, leaving him without any real means of defending himself and his honor. Rumors will in a case like this run amok. Some say that this is nothing but jealousy within the family, where one major player can’t stand the fact that the new Prince has become more popular than himself. During his short years as Prince, Nicholas has endeared himself to the Romanian people. “Charming and handsome, he is a committed environmentalist, enthusiastic sportsman and keen supporter of children’s charities” (The Guardian). Other rumors circulating suggest that he might be gay, an embezzler or a socialist. Be this as it may, the actions taken by King Michael in this and other family affairs have become notorious. Of his five daughters, four have been divorced, one has been cut out of the line of succession after she pleaded guilty to helping run a cockfighting business while another seems to be an outcast still, for marrying the wrong man, a charlatan and a fraud. The King, now 94, who has been a most respected historical figure and the sole surviving leader from World War II, is now losing much of that appreciation because of a series of hasty, unfair and illogical decisions pertaining to his own immediate family. A rhapsody is a work of epic poetry that is suitable for recitation. The Romanian Rhapsody, or Tragedy, of recent years is best forgotten.